In the Indian Tantric tradition, the Manipura chakra, or "place of gems", is decsribed as having ten petals, red in colour with a downward pointing triangle, representing the tattwa of fire. This chakra is traditionally located at the navel (hence the alternative name of nabhi (navel) chakra), but in many modern (especially Theosophical- and New Age - orientated) chakra formulations it is placed at the Solar Plexus. This latter however seems to refer to a distinct (minor) chakra - the Solar Plexus chakra. 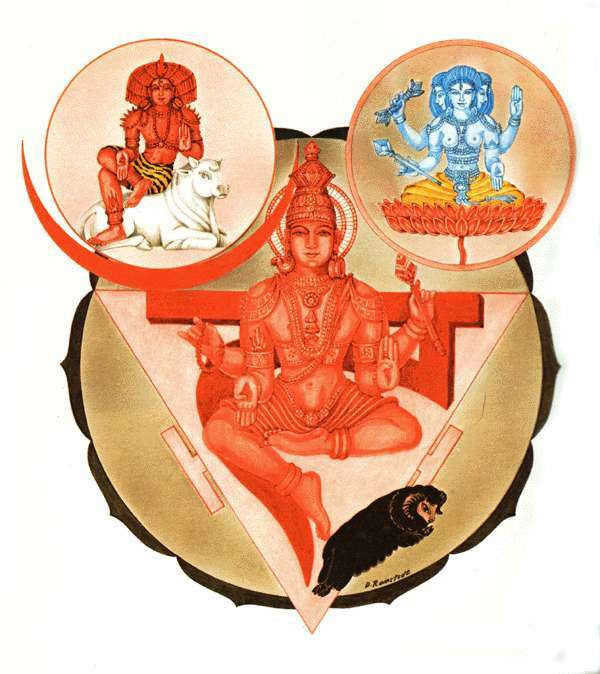 Deities within the Manipura Chakra. Table for Manipura Chakra 3. In addition to the front (navel) and rear (kidney) "Manipura" Centres, there is a third Centre, red in colour, located in the central "Thrusting Channel" that links the Perineal and Crown Chakras. In Tibetan Buddhism this centre is called the Wheel of Emanation (corresponding to the Nirmanakaya or manifest physical body), it is said to have sixty-four petals, a central triangle, and is the source of the Red Drop or Tumo that when activated ascends and unites with the descending White Drop in the central Heart Chakra. This centre links to the Pubic and Perineal chakras. It is not part of the normal microcosmic orbit, but is associated with higher yogic consciousness. This centre is equivalent to what Barbara Brennan calls the Tan Tien, and describes it as the one note that holds our physical body in manifestation [Light Emerging, p.289]. She describes it as being one and a half inches below the navel - about the position of the Sea of Chicentre, and is linked downward to the molten core of the Earth. This inner Tan Tien or central Muladhara would in fact stand behind and suport the outer Tan Tien or Lower Elixar Field, just as the entire chakra system supports the physical body. Perhaps it is this central Manipura or Lower Tan Tien centre that represents the red or Fire-polarity usually associated with the central part of the Tantric Manipura chakra; remember that in Tantra, the central and the rear chakra-series are confused. Astrologically (in terms of the etheric body of the solar system), the planet or Celestial Sphere that links with the Manipura in the Geocentric astrological arrangement, is Venus, and hence the Lower Emotional Body. The spiritual philosopher Oscar Marcel Hinze, in his essay "Understanding Archaic Astronomy", relates Mercury to the Swadhisthana chakra (which however I would associate with the Moon), and Venus to the Manipura, which does match this association. However, in the Heliocentric arrangement, the astrological planet or macrocosmic chakra associated with the Manipura is the Celestial Sphere of Mercury (again, not the same as the physical planet).